Chelsea have completed the signing of Roma defender Emerson Palmieri for a fee of £17.6m. 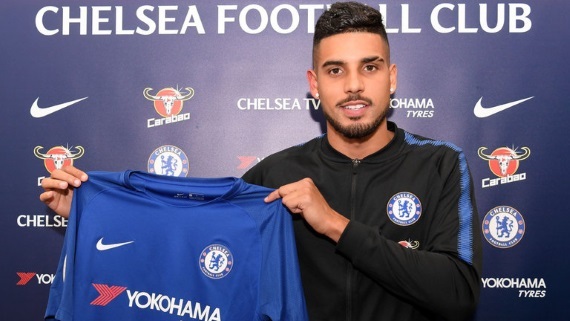 Chelsea have signed defender Emerson Palmieri from Roma for a fee of £17.6m. The 23-year old flew into the UK on Tuesday for a medical before signing a four-and-a-half-year-deal with the Blues. The Brazil-born player appeared 36 times for Roma last year but missed the first three months of this season because of a knee injury. He has made just two appearances so far this term. "I came here because it's a great team with a great history. Today I am realising one of my dreams to pull on the shirt of such a great club," he said. "English football is something I have been watching since I was 15 years old. It is a really beautiful game over here." Described as a versatile left-sided player, Palmieri joined Roma from Brazil side Santos in December 2016. He switched his international allegiance to Italy after gaining citizenship in 2017 and has been called up to the Italian squad on several occasions. Palmieri will wear the number 33 shirt at Chelsea.